In quiltmaking, as in homemaking, we all have personal frugalities. For example, in my kitchen I like high quality, white paper towels, but I use them . . . mindfully. In my sewing room I sometimes throw away small fabric scraps others would save, but I also often pack up used TV step-out elements or fabrics I decide I don’t like any more in ziptop bags and put them in the Goodwill box. The project currently on my wall started with leftover Nine Patches I received last year in a 3″ block exchange with Liz Porter and friends. Everyone wound up with over two hundred scrappy blocks. (That’s approximately 1000 different darks and almost as many shirtings!) I used a bunch of mine in “Patchworthy,” scheduled for the January/February 2019 issue of Love of Quilting magazine and on a TV episode that will air some time in the second half of 2018. Unwilling to let my remaining Nine Patches go to waste, I started “Cozy” (working title) with my leftovers. I liked what I saw well enough to join more strips and make the over 100 additional little blocks needed to knock out a cozy nap-sized quilt. Beautiful! I look forward to seeing it in the 2019 issue of LOQ! Well, I like!! Such beauty all from scraps! Thank you for sharing! I have a bag full of nine patches! Love it! I like that you’re using all those small blocks and not just putting them in a plastic bag and “forgetting them”. As usual, your quilts are something special to see. Jean, I’m so glad you like! Very pretty. Love the border. 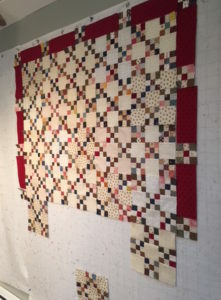 Your writing and perspective on quilting is lovely. I was drawn in to check your blog by the comment, “my latest, greatest quilt is always the quilt I’m currently working on.” That is true for me, too. I am so in love with the process of fabric choices, design wall, waves of inspiration, and delight in the bloom of a quilt happening. Thank you for sharing your talent with all of us via social media. You inspire me. The simple traditional designs are timeless. Your border is interesting. For me, it draws my eyes out to each 9 patch in the border. Interesting. Gorgeous! Love the colors and I love scrappy! It is beautiful. I love that you are sharing with us via social media. For me, it’s like I’m hearing your voice and seeing your expressions as I read your words. Such a treat. I encourage you to post often; for those of us who miss seeing you regularly on LOQ, it is a special treat indeed. Diana, thank you! You made my day!